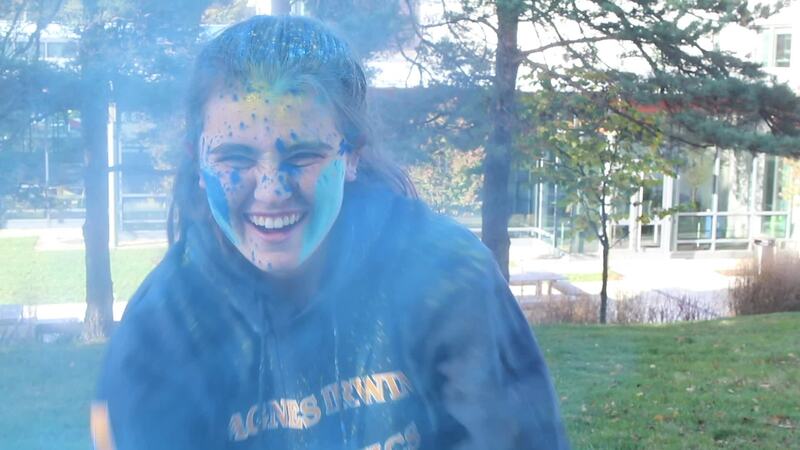 Agnes Irwin pride is on display during AIS/EA Day, a four-sport competition against Episcopal Academy every fall. Pep rallies, team dances, and spaghetti pre-game dinners lead up to this annual event where students, faculty, and alumnae don blue and gold in support of the Owls. Come cheer on the Agnes Irwin Tennis, Cross Country, Field Hockey, and Soccer teams! Can't make the games on Friday? We will livestream the Field Hockey and Soccer games (weather permitting) beginning on Friday, November 9 at 12:30 p.m.
Cross Country | 11:30 a.m.
Field Hockey | 2:30 p.m. Shuttle buses to and from both parking locations will be available starting at 10:45 a.m. on Friday and run continuously until the conclusion of the last contest. We welcome our AIS Alumnae back to campus for another great AIS/EA Day, full of competition and camaraderie. Please stop by the AIS tent to reconnect with old friends and stop by our outdoor swag shop to gear up in blue and gold! On Saturday, November 10, the Agnes Irwin Alumnae Association will host the 2018 Athletic Hall of Fame Induction Ceremony and Dinner in the Student Life Center at The Agnes Irwin School. For more information, please email Director of Alumnae Relations Brooke Norrett Corr '95. Thank you to our AIS/EA Day 2018 Sponsors!